Composting is a popular way of recycling household waste that would otherwise need to be collected by waste disposal operatives (who would produce carbon emissions in the process) and placed in a landfill site. Making compost also reduces the need for you to make journeys to buy compost, and provides you with a useful aid to producing your own vegetables or flower garden. Composting relies on a natural process whereby micro-organisms that exist in the soil eat organic matter and convert it into a rich pulp called 'humus' that is further broken down to fine compost, within a minimum of 2-3 weeks. Hole in the ground: It is possible to make an enclosure simply by digging a cube shaped hole in the ground, 2-3 feet deep, and placing wooden struts in the corners for support. Wire Mesh Enclosure: A wire mesh enclosure can be made with four posts arranged in a square or rectangle, wire stretched across this frame to form a box shape. Wooden Panelled Enclosure: As above, but with wooden panels stretched and mailed between the posts on each side to form a wooden box. Compost Bins: Either use an existing bin, or buy a bin ready for composting. Compost bins can be sunken a foot into the ground, and sometimes have holes in the side to help the compost aerate. Some bins are place horizontally or vertically on a frame, like a 'tombola', and can be rotated by handle regularly to mix up the ingredients. In order to make compost you will need a mixture of moist ingredients, such as vegetable waste, egg shells and freshly cut grass, and dry ingredients, such as straw or hay and dried leaves. Other ingredients include cardboard and soft papers such as tissues and paper towels. It is essential to avoid using meats and fish and oils (which will attract vermin), newspaper and magazines. An imbalance of wet and dry ingredients will result in a smelly thick compost (if too many wet ingredients are used), whilst compost with too much dry material will take a long time to decompose. A compost heap should be kept moist, but not wet; moisture will aid the composting process. Too much water will turn the compost to mud; a sturdy lid will help protect your compost from moisture in wet weather conditions. If you want your waste to compost quickly, it is necessary to turn it by fork or spade regularly, this will enable the wet and dry ingredients to work with each other, whilst he lower, older compost or humus can aid the development of new waste. 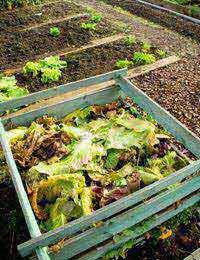 If you wish to make compost to support and organic garden it is essential not to compost anything whish is not organic. This will entail leading a wholly organic lifestyle - if you don't eat or otherwise consume any organic products in the household it should be possible to avoid composting such products.